This design has been serialized in Engineering in Miniature starting in September 2006 and as at December 2011 is ongoing. After some thought that this could be a reasonable sized loco, but with substantial passenger-hauling abilities, I started by getting the initial 10 drawings from Chris Rayward at Hotspur Designs. 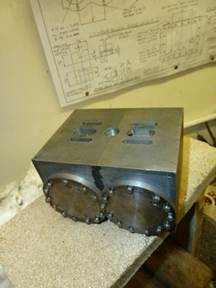 Where possible I have used the laser cut or CNC machined parts that Chris supplies. Ted Talbot’s book ‘LNWR Eight-Coupled Goods Engines’ should be obtained from the library. In my case my daughter located a copy on the interweb following a request on my Christmas list. The frames, suspension, wheels and cylinders have progressed successfully. I had no trouble in following Nigel’s instructions for machining and assembling the cranks. But the jig for boring the holes in line wouldn’t swing on my Myford and so some modifications were necessary before this could be achieved. 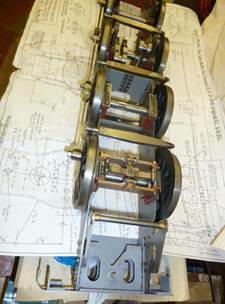 The suspension on the final axle is as per the original Webb design. It has to fit under the ashpan and so the springing is carried between sub-frames with links to the rear axle hornblocks. Getting the ‘H’ section for the wheels is an interesting exercise. Getting rid of all the swarf having milled out six coupling rods from 20 x 20mm hot rolled material (to reduce machining stress bends) was also a problem. 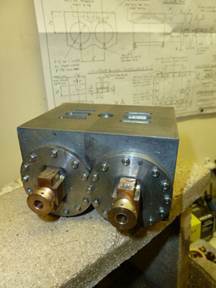 Machining the cylinders is a stress-inducing task. The casting is expensive and as the machining progresses, you realize that as well as purchasing a replacement casting, all that machining will have to be redone in the event of a major mishap. In fact my only difficulty was in cutting the exhaust ports of which there are sixteen four each at front and back of each cylinder. Although the ports all exit in the same area on the top face of the cylinder block, they start at different points on the circumference of the cylinder bore and it follows that they must each travel at a slightly different angle. 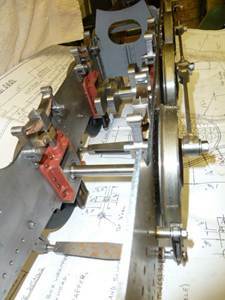 I used a computer CAD program to ascertain the exact angle and then, following Nigel’s instructions, set the block up on an adjustable angle plate and started the process by slot-milling a flat into the edge of the cylinder bore. That was followed by a No 2 centre drill and then by an undersized metric drill (metric drills are cheaper to replace when they break! ); finally opening out to 5/32”. 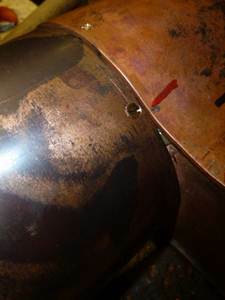 The problem arose with port No 16 when the centre drill broke. Picking at it with a scriber point failed as did trying to drill out the hardened fragment. Eventually I used a tungsten carbide dental drill in the Dremel and cut round the area and the centre drill of the centre drill (if you follow that) fell out. 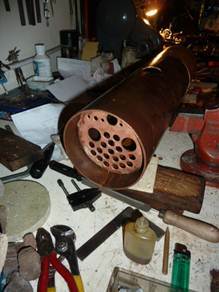 By this time December 2010 is near and I decided to do some boiler work to heat up the workshop. 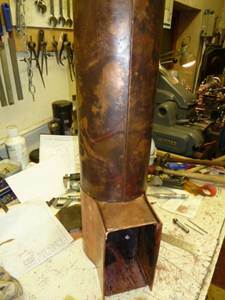 However I couldn’t find any copper tube of the correct dimensions for the barrel and so decided to roll it from sheet material. 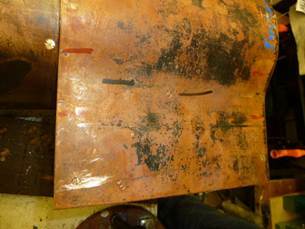 The kitchen stove successfully achieved an annealing temperature for the sheet and the barrel was successfully rolled. 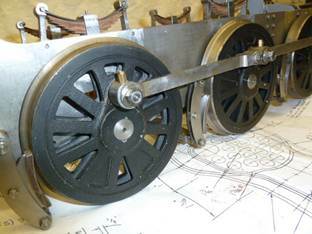 At this time Model Engineer was serializing Ray McMahon’s Darjeeling and Himalayan narrow gauge loco and he had got to boiler construction and he used small PB countersunk screws to hold his boiler together whilst under construction. As I intend to have my boiler ‘glued’ together by one of our properly equipped club members, but still need the boiler inspectors to see the construction, I decided to screw mine together in the same fashion. However it does mean manufacturing a lot of 5BA PB countersunk screws! I know – it’ll never hold water! Especially with all those screw holes!